The vast majority of my foundation donors originated from Tim Ohlde’s herd in Kansas. Therefore, it should be no surprise that the genetic base in the FCC program is an almost exclusive concentration of ‘OCC Bloodlines’. I was first introduced to Tim Ohlde’s herd back in 1996. I just happened to be traveling through Kansas during the state’s annual angus tour. Fortunate for me, their place was one of the stops along the route. It only took a few minutes of looking for me to realize that he already had “the type of cow” that I had been trying to produce. Our programs emphasize line breeding to consistently produce attractive, moderate-framed, deep-bodied, easy fleshing females! I have NO INTEREST in breeding cattle based predominately upon numbers! It seems that has become the standard method of making breeding decisions for many in the cattle industry over the past decade or so. I do take numbers into consideration, but mainly just to avoid extreme negative values. I think most astute cattleman would agree that the GOOD WORKING COWS have a certain look about them! And it is NOT something that you can put An EPD value on! 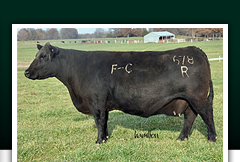 There is definitely more to breeding cattle than just selection based upon numbers. I have tried to concentrate on what will result in a GOOD, FUNCTIONAL FEMALE that still has a nice look and hopefully added sale value. I tried to start with productive cows from proven cow families as donors. 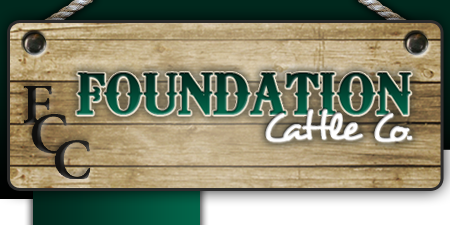 Thus, the name ‘FOUNDATION CATTLE COMPANY’ was born. Furthermore, I have relied heavily on my embryo transfer program to help propagate the elite donors. 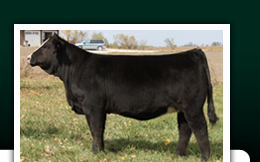 The angus part of the program has a very heavy concentration of 4 very time-tested maternal sires: PBC 707 1M F0203, DHD Traveler 6807, Basin Rainmaker 654X and N Bar Emulation EXT.